One of the main goals of photosynthesis is to take the ATP and NADPH produced through the electron transport chain and use them to store energy in the form of carbohydrates. The key event in carbohydrate storage is the capture of carbon dioxide from the atmosphere. That task is carried out by ribulose-1,5-bisphosphate carboxylase (usually abbreviated as rubisco). Rubisco is found inside the chloroplasts, in the stroma. Figure PS8.1. X-ray structure of ribulose bisphosphate carboxylase from spinach, shown in a cartoon view. Rubisco is an aggregate of sixteen proteins, but it contains only two different kinds of proteins; it is composed of eight molecules of one protein plus eight molecules of the other. It is a huge protein, with a molecular weight of 50 or 60 kDa. Its primary function is to use a five-carbon sugar, ribulose, as a scaffold on which to attach a carbon dioxide molecule. The result, after reduction with NADH, is a six-carbon sugar. In the picture below, you can see the ribulose-1,5-bisphosphate molecules awaiting their carbon dioxide. There are actually eight of them, but they are arranged in four stacks when viewed from this angle, with four molecules in the front and four behind them. Figure PS8.2. 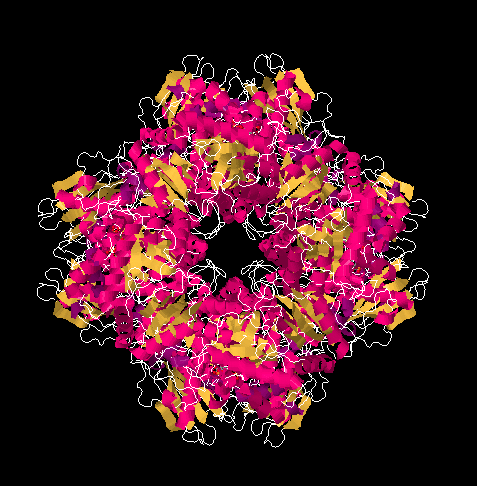 X-ray structure of ribulose bisphosphate carboxylase from spinach, shown from the same angle as the previous picture but in a ligand-only view to reveal eight bound ribulose-1,5-bisphosphate molecules. The capture of the carbon dioxide is accomplished through a simple aldol reaction. Under biological conditions, this reaction happens via the neutral, enol form of ribulose-1,5-bisphosphate, rather than the anionic enolate ion, because there is not a strong enough base to produce appreciable quantities of the enolate ion. To get to the enol form, a proton must be transferred from an alpha position to the oxygen of the ketone. Scheme PS8.1. Aldol reaction between the enol form of ribulose-1,5-bisphosphate and carbon dioxide. Provide a mechanism, with curved arrows, for the capture of the carbon dioxide by the enol of ribulose bisphosphate. That intermediate, resulting from the aldol reaction of ribulose bisphosphate and carbon dioxide, does not last very long. It is quickly hydrated to form a geminal diol (twin OH groups on one carbon), and the geminal diol decomposes via a retro-aldol reaction. Remember, a retro-aldol reaction is an aldol reaction in reverse. Instead of an enolate nucleophile adding to a carbonyl electrophile, an alcoholic oxygen pi-donates to form a new carbonyl, and as a result an enolate is produced as a leaving group. Scheme PS8.2. The rapid decomposition of the carbon-captured intermediate to 3-phosphoglycerate. Provide a mechanism, with curved arrows, for the cleavage of the geminal diol into two 3-phosphoglycerate molecules. At this point, the ATP and NADPH produced in the electron transport chain come into the picture. The NADPH converts the carboxylate group into an aldehyde; at that point, the CO2 has become fully incorporated into a normal sugar, albeit the smallest one there is. The ATP is first used in order to activate the 3-phosphoglycerate. The NADPH can't displace the oxide (O2-) from 3-phosphoglycerate; oxide is a terrible leaving group, and the carboxylate group isn't particularly electrophilic with that negative charge hanging around. The 3-phosphoglycerate would be a much better nucleophile. Well, instead of reacting directly with the NADPH, it reacts with the ATP forst. Phosphoglycerate kinase activates the ATP, which is then ready to behave as an electrophile. The negatively charged 3-phosphoglycerate donates to the terminal phosphate group on the ATP, displacing ADP. The kinase has done its job, forming a phosphoanhydride. Scheme PS8.3. The conversion of 3-phosphoglycerat to glyceraldehyde-3-phosphate. Let's think about phosphoanhydrides for a minute. They are a little like acid anhydrides in structure. An acid anhydride has an oxygen atom between two carbonyls. Normally, the excellent pi-donating ability of an oxygen atom "protects" an attached carbonyl from approaching nucleophiles; in a sense, the electrophilic site on the carbonyl is already filled by the lone pair from the oxygen. In an anhydride, however, that lone pair is in a dither. It is divided between two carbonyls and so it can only donate half as well to either one of them. Since it isn't doing much good as a pi-donor, the other half of oxygen's behaviour emerges: it is also an excellent sigma-acceptor, because it is a very electronegative atom. That leaves the acid anhydride as a very good electrophile. Figure PS8.3. Three analogous electrophilic structures. Of course, phosphoanhydrides behave in exactly the same way, but the ostensibly pi-donating oxygen is stuck between one carbonyl and one phosphoryl group. It is unable to pi-donate effectively to the carbonyl, and so its electron-withdrawing ability takes over instead. A phosphoanhydride is an excellent electrophile, just like a regular anhydride. Both are "high on the ski hill", if you remember the analogy for carboxyloid reactivity. Incidentally, polyphosphates tend to be pretty electrophilic, too, which is one of the factors driving the high reactivity of ATP. The result is that the rather nucleophilic 3-phosphoglycerate has been transformed in one step into the highly electrophilic 1,3-bisphosphoglycerate, an example of a phosphoanhydride. That makes it much easier for the NADPH to donate a nucleophilic hydride to the carbonyl, forming an aldehyde. The exact mechanism, catalysed by glyceraldehyde phosphate dehydrogenase, involves a group transfer step. The carbonyl is transferred from the phosphate group to a cysteine residue in the enzyme. The advantage of group transfer is chiefly entropic: instead of the NADPH and the phosphoanhydride both binding in the enzyme and reacting together, at this point the NADPH must simply bind with the enzyme and react with the enzyme itself, because the glycerate group has become covalently bound to the enzyme. Moreover, the new functional group formed during group transfer is a thioester. Thioesters, like phosphoanhydrides, are excellent electrophiles. Although the second-row pi-donors, oxygen and nitrogen, are exceptionally good at donating to carbonyls, the third-row pi-donors, such as chlorine and sulfur, are not. Instead, their relatively high electronegativity activates the carbonyl. That means group transfer occurs without any loss of reactivity, which is essential for catalysis. Figure PS8.4. Two high-energy electrophilic structures; both have weak, third-row pi-donors. Provide a mechanism for the NADPH reduction of 1,3-bisphosphoglycerate. The glyceraldehyde formed via reduction by NADPH is the simplest of the carbohydrates; you can think of it as the grandmother of all sugars, which can be thought of as forming through extension of glyceraldehyde's carbon chain. In this case, we really have the phosphorylated form of the sugar, rather than the sugar itself. 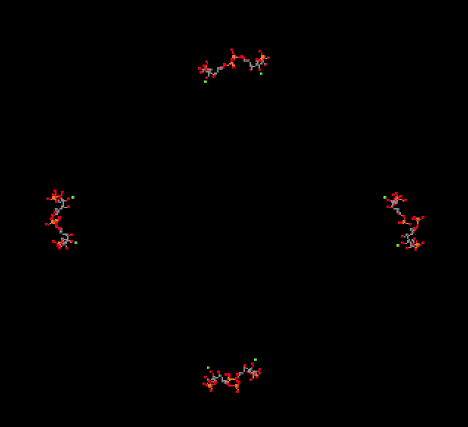 Glyceraldehyde, or glyceraldehyde-3-phosphate, can be transformed easily into another molecule via tautomerism. That is the movement of one proton from one position to another, and in this example it leads to dihydroxyacetonephosphate. Scheme PS8.4. Tautomerism between glyceraldehyde and dihydroxyacetone (phosphorylated version). Show the enol intermediate between glyceraldehyde-3-phosphate and dihydroxyacetone phosphate. Glyceraldehyde is, of course, an aldose, with its carbonyl at the end of the three-carbon chain, forming an aldehyde functional group. The other carbons have hydroxyl groups; that's what makes it a carbohydrate (a polyhydroxylated aldehyde or ketone). Dihydroxyacetone is a ketose, with its carbonyl in the middle of the chain, forming a ketone functional group. That group is flanked by two alcohols. The fact that glyceraldehyde can turn into dihydroxyacetone is partly significant because the biosynthetic potential of this small building block is opened up by allowing it to form twice as many structures. There are a number of ensuing reactions that have the effect of quickly interconverting these sugars into different carbohydrates in a sort of carbon pool. The plant can draw on this carbon pool for various purposes, whether it is to send sugars elsewhere in the plant or to regenerate some more ribulose in order to grab more carbon dioxide. By grabbing more carbon dioxide, that carbon pool gets bigger and bigger. The series of reactions governing this carbon pool is called the Calvin cycle. It is really more of a network than a cycle, with molecules able to hop back and forth between various parts of the cycle, rather than everything following monotonously in lockstep. For example, the aldol reaction of those two triose phosphate molecules -- dihydroxyacetone phosphate and glyceraldehyde-3-phosphate -- leads to fructose-1,6-bisphosphate. This reaction is accomplished through the help of an enzyme, aldolase. Fructose, or fruit sugar, is one of the few sugars that are readily absorbed through our digestive system. Scheme PS8.5. Aldol reaction of two trioses to make the hexoketose, fructose (again, a phosphorylated version). Many biological aldol reactions actually occur via an enamine intermediate. a) Provide a mechanism for the formation of an enamine from dihydroxyacetone phosphate. b) Provide a mechanism for formation of fructose-1,6-bisphosphate via the enamine of dihydroxyacetone phosphate. Why is enamine catalysis used in biochemical pathways? What makes it faster than a regular enol pathway? The next step in the Calvin cycle is just a dephosphorylation, carried out with the help of a phosphatase. In this case, the enzyme is called fructose-1,6-bisphosphatase. Phosphorylations and dephosphorylations of substrates, like phosphorylation and dephosphorylation of enzymes, are often key regulatory steps, required to promote a reaction involving an enzyme. Scheme PS8.6. Transformation of fructose-1,6-bisphosphate via a phosphatase. On to the next step. This is when things get a little bit funky. Two carbohydrate molecules undergo a sort of metathesis together. In a metathesis reaction, compounds are split up and recombined in a new way. In this reaction, fructose-6-phosphate combines with another glyceraldehyde-3-phosphate. After the reaction, the two old sugars have been changed into two new ones: erythrose-4-phosphate and xylulose-5-phosphate. It appears as though the fructose has been split and two of its carbons have connected with the glyceraldehyde chain. Scheme PS8.7. The reorganisation of fructose-6-phosphate and glyceraldehyde-3-phosphate into two new sugars. How does that happen? The main part of the fructose-6-phosphate molecule turns into erythrose-4-phosphate. You can imagine that much happening if the number three carbon's hydroxy group performs a pi donation to form the new aldehyde group. That's the topmost OH group, in black, in fructose-6-phosphate. That explains the erythrose-4-phosphate formation. The trouble is, that pi donation would require that something leaves carbon three. The leaving group would be an anionic carbonyl. You probably haven't seen such a leaving group before, for good reason. Scheme PS8.8. A mechanistic quandary: conversion of fructose-6-phosphate to erythrose-4-phosphate formally appears to involve an unprecedented leaving group. Let's not abandon this idea, just yet. If that leaving group did form (and it doesn't), that would explain the formation of xylulose-5-phosphate, too. The carbonyl-based anion, if it were to act as a nucleophile, would form a new carbon-carbon bond, opening up the carbonyl of glyceraldehyde-3-phosphate to form the hydroxy group on what is now carbon three of xylulose-5-phosphate (uppermost on the left, in black). There is more to this reaction than just one step. The problem is, we need to form a better leaving group. That will take some extra effort. The addition of the ylide of thiamine pyrophosphate (TPP) will help. By adding temporarily to the carbonyl of fructose-6-phosphate, we can get around the problem of having an anion form on the carbonyl carbon. Figure PS8.5. Thiamine pyrophosphate. The corresponding ylide is able to stabilise "carbonyl" leaving groups. This same strategy comes up during the citric acid cycle (or TCA cycle), where you may have seen the TPP ylide before. In that cycle, the decarboxylation of pyruvate is impossible because there is no alpha carbon on which to stabilise the anion that forms via decarboxylation. The negative charge on the carbonyl carbon may seem like a good idea, because it is near the electronegative oxygen. Unlike an alpha position, though, the lone pair cannot fully delocalise onto the oxygen. That's because the lone pair associated with the anion -- the lone pair that forms from the broken bond -- must be orthogonal to the pi bond. Figure PS8.6. An impossible leaving group during decarboxylation of pyruvate. TPP comes to the rescue. Addition of TPP ylide to the ketone installs an iminium ion, turning the former carbonyl carbon into an alpha position (it is alpha to an imine instead of a carbonyl, but it works the same way). The required anion is now fully stabilised by resonance. Figure PS8.7. TPP ylide transforms an impossible leaving group into a possible one. In the transketolase reaction, the anion also needs to be stabilised at the carbonyl position. The TPP ylide can add to the carbonyl of the sugar, installing an imine next to the former carbonyl carbon. After the reaction is done, the TPP can be displaced again to form a new carbonyl on xylulose-5-phosphate. All of this process is catalysed by an enzyme, transketolase. Provide a mechanism for the TPP-mediated conversion of fructose-6-phosphate and 3-glyceraldehyde phosphate into erythrose-4-phosphate and xylylose-4-phosphate. That isn't the only reaction catalysed by transketolase. Sedulose-7-phosphate also reacts with glyceraldehyde-3-phosphate, in this case forming ribulose-5-phosphate and xylulose-5-phosphate. Note that first product: ribose. Ribose is the ketose form of the aldose sugar, ribulose. Ribulose was the sugar we started with; its bisphosphate form was taken up by rubisco to trap CO2. We are very close to completing a cycle, and are almost ready to capture another carbon dioxide molecule, adding more stock to the carbon pool. Scheme PS8.9. The similar reaction of sedulose-7-phosphate with glyceraldehyde-3-phosphate is also catalysed by transketolase. But where does that sedulose come from, anyway? That's the product of another aldol reaction, this time between dihydroxyacetone phosphate and erythrose-4-phosphate. Erythrose-4-phosphate was the other product of our first transketolase reaction. Scheme PS8.10. Sedulose-1,7-bisphosphate is formed via and aldol reaction, catalysed by aldolase. We are almost finished the complete Calvin cycle. First, ribose-5-phosphate just needs to be converted to ribulose-5-phosphate. That entails a keto-enol mechanism, in which an alpha proton is transferred to the carbonyl oxygen. The reaction is accelerated in the presence of the enzyme, ribose phosphate isomerase. Scheme PS8.11. Ribulose-5-phosphate is also formed via tautomerism of ribose-5-phosphate. Show the enol intermediate between ribose-5-phosphate and ribulose-5-phosphate. Ribulose is produced in another reaction within the Calvin cycle, too. Ribulose-5-phosphate is just the epimer of xylulose-5-phosphate. In other words, it is the stereoisomer formed by removing a proton from the chiral alpha position of xylulose-5-phosphate and putting it back on the wrong side. The configuration at that position is changed from (S) to (R), producing the diastereomeric ribulose-5-phosphate instead. This reversible reaction is undertaken by the enzyme, ribulose phosphate epimerase. Scheme PS8.12. Ribulose-5-phosphate is also formed via epimerisation of xylulose-5-phosphate. Xylulose-5-phosphate was one of the products of both transketolase-catalysed reactions; one of those reactions also produced ribose-5-phosphate. That means the same reaction provides two precursors to ribulose-5-phosphate (xylulose-5-phosphate and ribose-5-phosphate) and another reaction, catalysed by the same enzyme, produces a third (another molecule of xylulose-5-phosphate). The name, ribulose phosphate epimerase, suggests that the same enzyme actually carries out the reverse reaction: the conversion of ribulose-5-phosphate to xylulose-5-phosphate. How might such a reversible reaction be regulated? The ribulose-5-phosphate will be ready to bind rubisco and take up a carbon dioxide molecule as soon as it is phosphorylated by ribulose phosphate kinase. This reaction is largely irreversible as written because of the expenditure of ATP. Scheme PS8.13. Readying the ribulose-5-phosphate for incorporation of another CO2 molecule in rubisco. X-ray crystal structures: Taylor, T.C. ; Andersson, I. The structure of the complex between rubisco and its natural substrate ribulose 1,5-bisphosphate. J. Mol. Biol. 1997 265: 432-444. Images obtained via RCSB Protein Data Bank (1RCX).